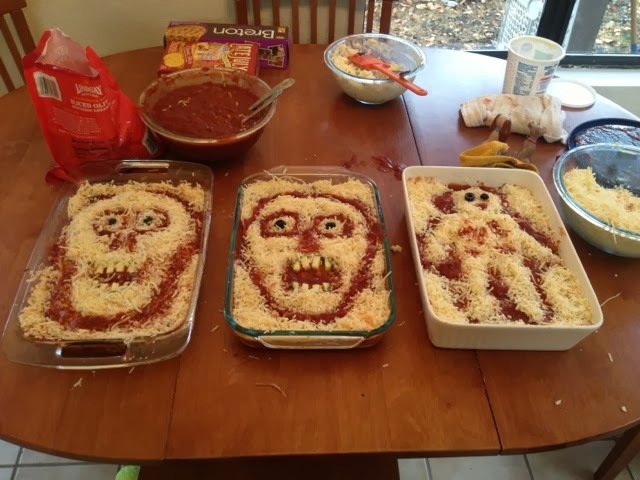 In the spirit of Halloween, I was looking for a main course that would be both visually entertaining and delicious. 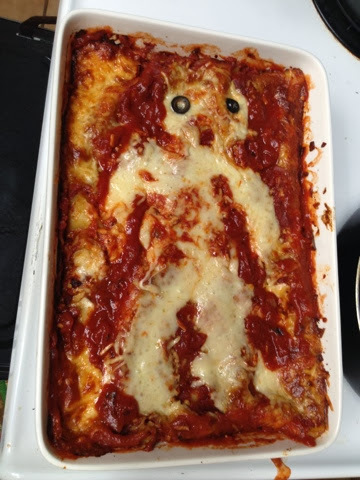 I was a vegetarian, at the time, so I came up with this creepy lasagna that was a big hit. I haven't gotten around to vegan-izing it yet, but I would certainly do it with some vegan ricotta cheese (made with tofu, parsley, and vegan mayo) and some type of vegan cheese for the topping which wouldn't be that hard. 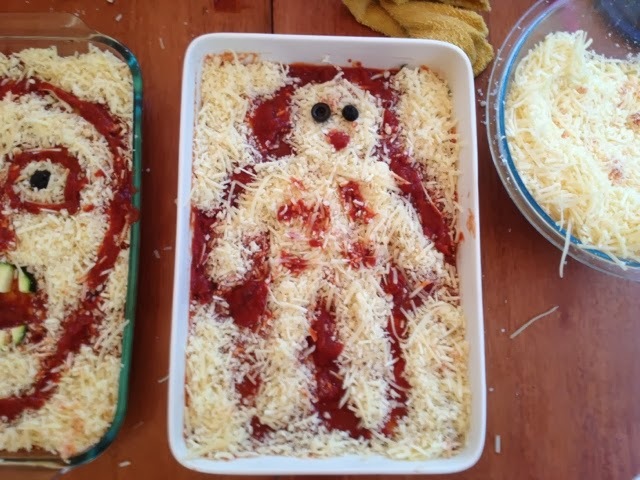 The lasagnas were assemble in typical layering fashion. 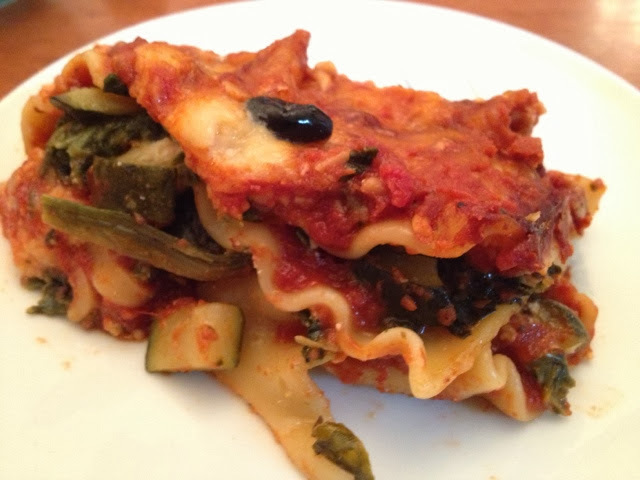 I'll be more specific on exact ingredients in another post, but here's the abridged version of how the layers go: sauce, lasagna noodles, ricotta (with parmesan romano mixed), sauteed vegetables (I used zucchini squash) and spinach, lasagna noodles, sauce, ricotta mix, vegetables, lasagna noodles, sauce, cheese (mozzarella/paremsan/romano). 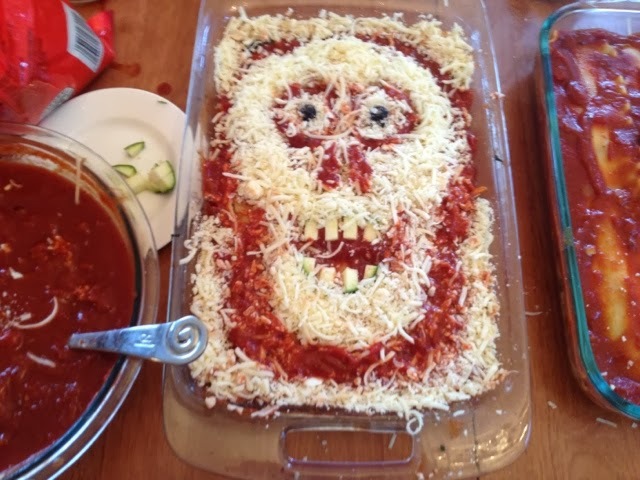 For the faces I used olives for the eyes and zucchini pieces for the teeth. 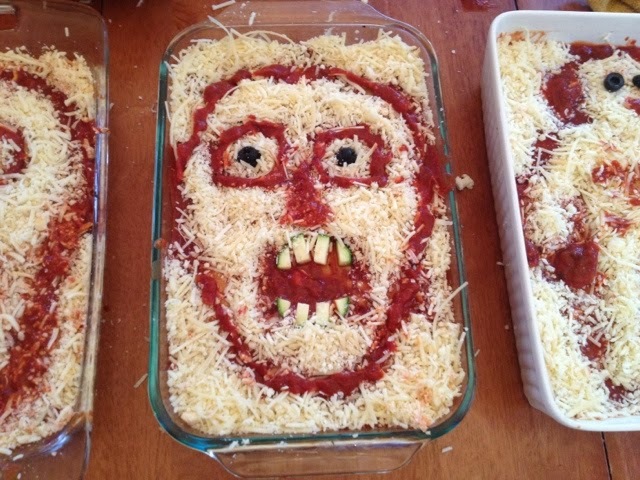 I tried to make sure there was plenty of cheese on top. Now, here is the tricky part. I cooked my lasagna covered with tinfoil for 45 minutes at 350 degrees. This is what my voodoo doll looked like when I pulled him out. 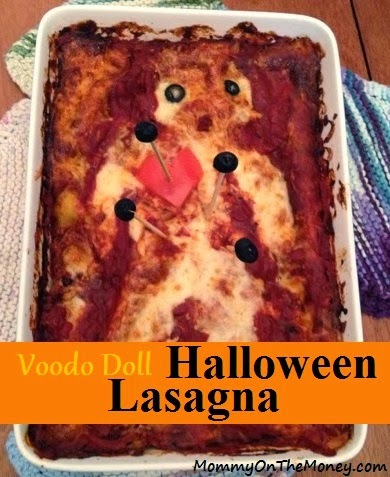 In the next step, I used some leftover sauce and a spoon to sculpt the voodoo doll back into a body. I was out of cheese, but next time, I may add a little mozzarella as well. 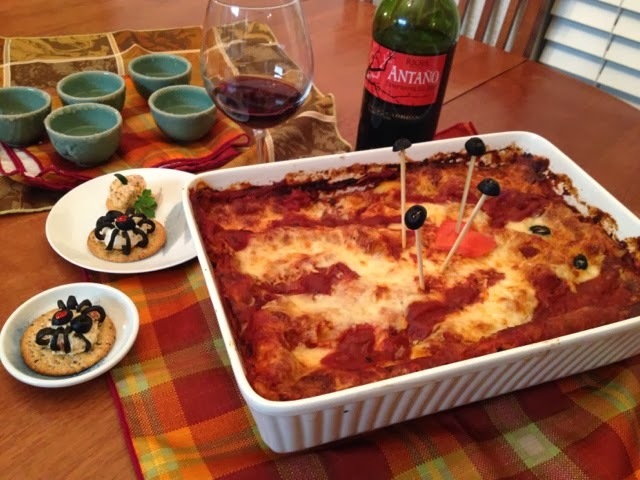 Once I was happy with the body, I put the lasagna back in the oven for 15 minutes without tinfoil to get browned and cook the extra sauce I had added. My husband made some vodka shots and I served with wine, and my spicy spiders and pumpkin patch appetizers (recipe to come, today!!!). What a party and it's not even Halloween, yet! 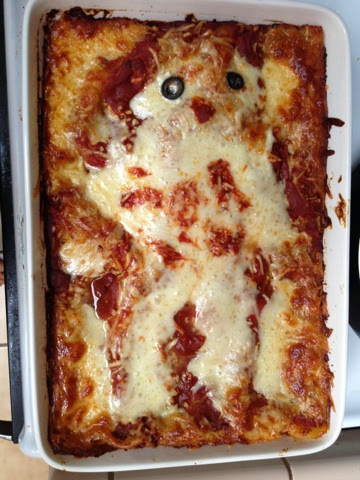 I froze the other two lasagnas, so I will update when I get those out in the next few weeks. 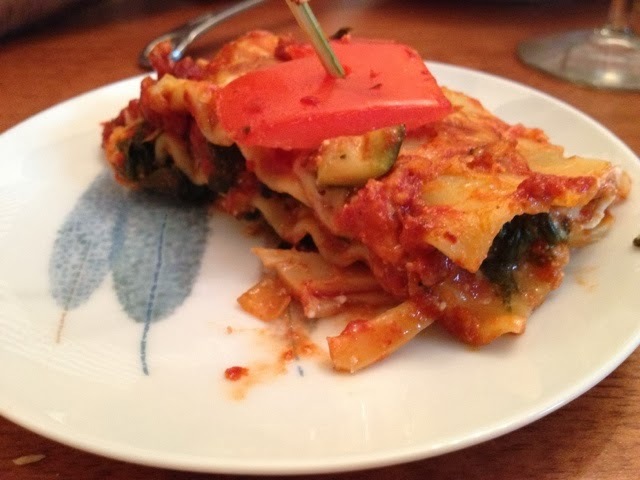 You can see all the veggies in my lasagna. With the part-skim ricotta and all the veggies, this is a healthy dinner, not a fattening, one! It is really delicious when you get to the heart of it!